General Member, Board of Directors Protectors of Animals, Inc.
Jessica Sokol works for the Office of Alumni Relations at the UConn Foundation, where she focuses on campus traditions and building a bridge between current students and alumni. 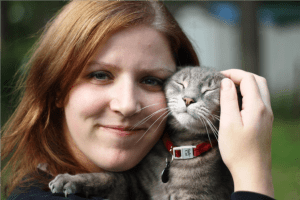 Jessica joined Protectors of Animals in February 2015 as a foster "mom" for a pregnant cat, and she continues to foster kittens and cats for the East Hartford location. In May 2017, she joined the Board of Directors as a General Member. Jessica holds a Bachelor's Degree in English & Communications from Massachusetts College of Liberal Arts and a Master's Degree in Higher Education & Student Affairs from the University of Connecticut.